Included in the Gold and Platinum Editions. 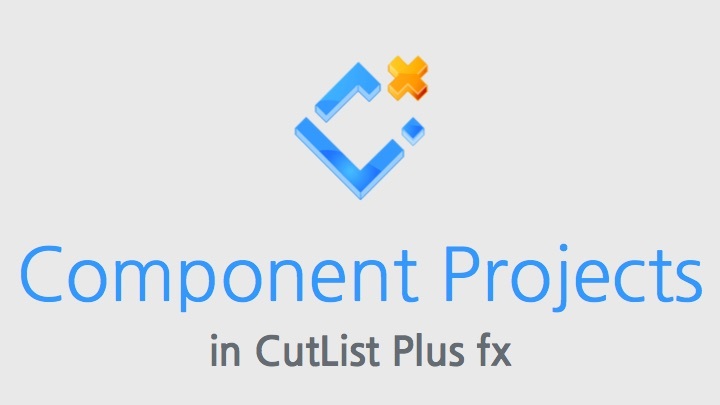 The Components Projects feature in CutList Plus fx Gold and Platinum Editions saves you a lot of time when building larger projects. It allows you to specify multiple copies of a project and combine several projects into one. This feature gives you a quick way to specify that you need to build more than one copy of a project. For example, you may need to build two identical tables, or four chairs. Instead of manually changing the quantity of each part, you can just specify that there will be several copies of the entire project. This is a very powerful capability. It allows you to create a "master" project that includes many smaller ones. For example, you could have a "library" of standard size cabinets. Then, to build an entire kitchen, you would combine various standard size cabinets, in various quantities, into one large project. This allows you to optimize the entire project as one unit (which is often more efficient), and get a price estimate for the entire project. If you would like to follow along with the video, here is a copy of the Cabinet A and Double Upper project files used to create the components tutorial. © 2019 Bridgewood Design LLC. CutList Plus is a registered trademark.